This past Saturday, HMNS was taken over by 200+ developers, bloggers and assorted other geeks (so, you know – normal Saturday 🙂 for Houston’s first WordCamp – a one-day conference for people who work with WordPress, a popular open source software for blogging and building web sites. Even if you don’t think you are familiar with it, you probably are: according to WordPress, more than 260 million people worldwide visit one or more WordPress blogs every month – in fact, you’re reading one right now! in Classroom 8 on the lower level of HMNS. Photo taken by BrettMorrison on Flickr and shared in the HMNS Flickr pool. From a keynote by WordPress founder Matt Mullenweg to sessions on everything from “must have plugins” to inspiring case studies from Andrea White and a thought-provoking discussion of the differences between journalists and bloggers – it was a fascinating day. Check out the blog posts below for what attendees thought about the event! Mike McGuff recaps his “Journalist v Blogger” panel with the Chronicle’s Dean Betz – a fascinating discussion of the new FTC Online Disclosure Law that ended up giving us all a glimpse into the future of the Houston Chronicle. Shawn Quinn gives us an “its-like-you-were-there” recap of WordCamp 2010 – I found it personally fascinating since he attended many of the panels I didn’t make it to. And, he came to the HMNS panel – thanks, Shawn! Messanonymous got into the sold-out conference by volunteering – and had a tech adventure. Not at all surprisingly, a conference about a blogging software generated quite a few posts (many more than what you see linked here, a not-so-random sample) as well as tweets about the event – so if you missed it, read on! We had a blast hosting – and attending – the event and are thrilled to see so many people had a great experience. Thanks to everyone who came out – hope to see you again at WordCamp 2011! It was a great time. I loved the venue — in fact I was there again today with my daughter. 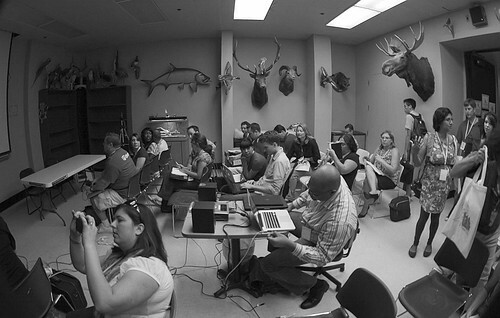 I hope there will be another WordCamp Houston again next year. I am also glad you liked the photo. I’m so glad you liked the Museum as a venue for the event – we definitely liked having you here 🙂 LOVED the photo – and was jealous 🙂 because Kelsey’s panel was spilling out into the hall by the time I got there, so I missed it. Brett — it’s almost a given this will become at least an annual event. Whether it returns to the same venue remains to be seen. While HMNS was a great venue for this event, it was not without its disadvantages. The organizers are led by a first-rate event planner so I would expect next year’s event to be even better no matter the venue. Erin – thanks so much to the Museum for hosting this. I got in at the last moment (thanks to HostGator for comping some tickets!) and ended up having a blast. At the end of the day, I came away with some ideas, and the start of a brand new blog (WordPress, of course!) Still trying to figures some of the stuff out, but looking forward to the journey. And, another ticket to see the Archaeopteryx will come in handy, as well! Ed – I am so glad to hear that you enjoyed it! We loved hosting…hoping they will want to bring it back here next year 🙂 I look forward to seeing your new blog!